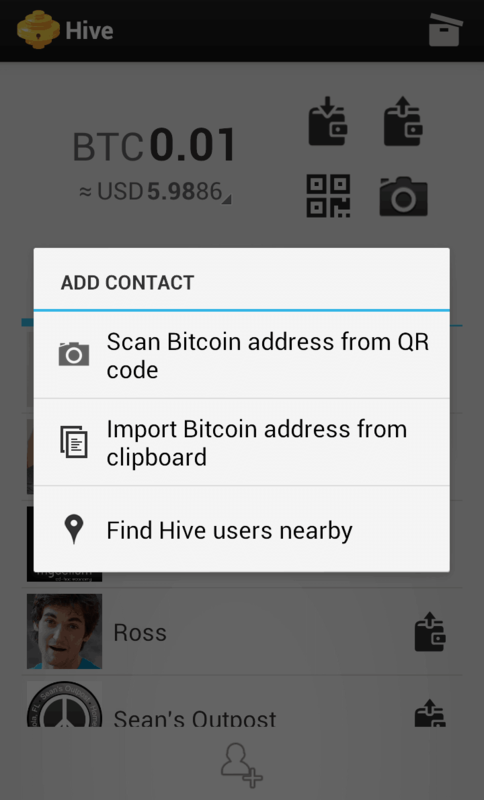 The Hive Bitcoin wallet for Android is rolling out a new feature this week that will make it easier to find and store contacts in the app’s address book. Using Bluetooth or GPS, the app can now discover nearby Hive Android users and automatically add them to the list of stored Bitcoin addresses. As I mentioned in my review of Hive, the wallet is designed to be visually attractive and people-oriented. 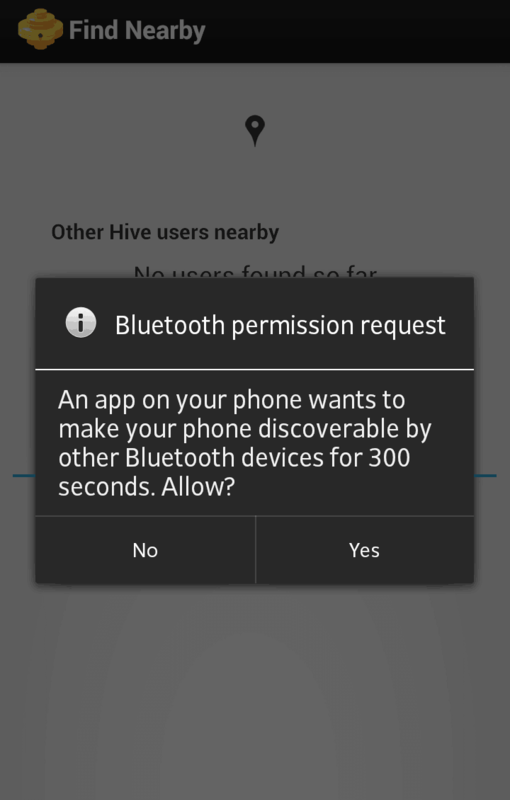 The addition of wireless discovery for new contacts falls in line with Hive’s ethos — instead of copying or scanning little codes, now it’s possible to connect with other Hive users easily through bluetooth. It’s an interesting and unique feature for a Bitcoin wallet. More traditional methods of storing a Bitcoin address involve scanning a QR code or copying the address from a device’s clipboard. Now there’s a new option for Bitcoiners who use the Hive Android wallet — search the surrounding area through Bluetooth or GPS for fellow Hive users to trade Bitcoin with. This is a brand new feature in the mobile Bitcoin wallet ecosystem, something that has never been tried before in an app like this. It will be interesting to see whether Hive gets widely adopted enough by Bitcoiners to the point where they can easily find each other in coffee shops, on college campuses, and other common areas. 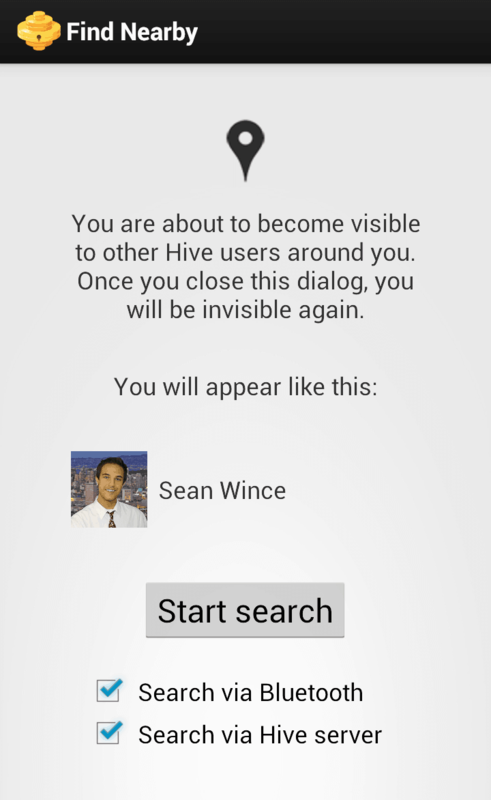 In order to find new Bitcoin contacts, it’s no longer necessary to know their public Bitcoin address — if both people use Hive on Android, they can discover each other just by being nearby. No code-copying is necessary, and the Bitcoin address is invisible behind a user’s preferred contact name. New users can either be discovered through Bluetooth, which searches the surrounding area directly, or by GPS transmitted from the device to a Hive server. The server then compares coordinates to let the user know who’s nearby. The addition of bluetooth and GPS to a Bitcoin wallet is an example of technologies converging to create new, interesting features. In some ways, it was probably inevitable for bluetooth to be implemented on a Bitcoin wallet, because it enables streamlined discovery of new payers and payees in the Bitcoin network. Right now the contact discovery feature is only compatible with fellow Hive users on Android, but it opens up interesting possibilities for the future of ad-hoc Bitcoin trading. If this type of wireless discovery is implemented by more wallets and adopted by more users, it could render QR code scanning obsolete. For now, though, it’s a very nifty feature in the latest update of an already-great wallet. Hive is shaping up to be a very clean Bitcoin wallet, and the developers clearly aren’t afraid to try interesting new features. This seems very intriguing, the ease of gifting a friend or buying items from a brick, and mortar store experimenting with the concept of using cryptocoins as everyday cash. i dont even know it is goo or bad idea..
adding GPS and bluetooth discoverability is a pretty slick idea.